The shipowners, traders, and processing & servicing companies in the fisheries sector all combine to make IJmuiden a leading player in northwest Europe when it comes to fish. The fresh fish sector makes a significant contribution to Dutch trade and export. 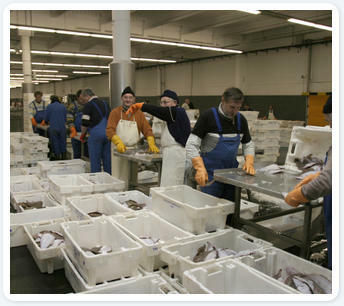 In the Dutch Fish Auction, various kinds of flatfish, including plaice, sole, flounder, turbot, and brill, as well as round fish such as cod and whiting are sorted and sold. Each year, over 10 million kg of flatfish and round fish are handled, generating revenues of circa 45 million euros per year and making the IJmuiden fish auction the second biggest in the Netherlands.